18K Gold 6.5mm Diamond Cut Wedding Band 690. The unique style of this ring has many great features which were handmade and cut by our brilliant jewelers who are experts at the craft. 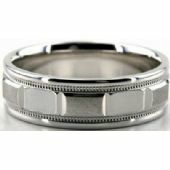 The center of this magnificent wedding band has alternating boxes which are made up of shiny finish, and satin finish. Milgrain surrounds the ring on each side of the alternating boxes and both sides of the 18K Gold Diamond Cut wedding band is shiny polished. 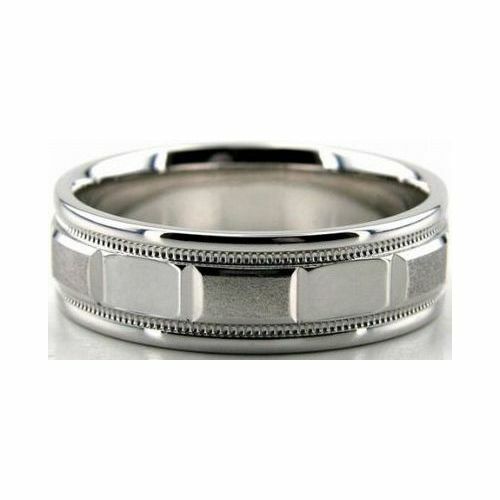 This 6.50mm wide wedding band was crafted in New York City, with all of our other products.